I was wondering if anyone knows if the 98-2002 T2 Camaro's are going to be accepted to AS with the T2 prep drivetrain. I think they were included in a Fastrack, but I don't know which one. I'll look into it. I do know they are supposed to be legal. FOUND IT: March Fastrack Tech Bulletin. Page 6. Errors and omissions. Damn, am I good, or what?? Last edited by jimwheeler; 06-29-2009 at 03:47 PM. Don't know. A t2 Camaro was turning 2:34 at the Sprints, with the AS Mustang winner turning a track record 2:30. Don't know what that same car could do with AS suspension, etc. What is the T2 weight on the Camaro and what is the AS weight for the T2 prepped car? 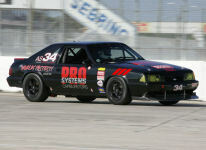 The T2 camaro driven by Bill Baten had the upgraded 17 x 9 inch wheels and the stiffer 1LE suspension on it. The car ran at 3630 lbs (100 lb penalty)and was 4.0 to 4.5 seconds off the AS leader's pace. I would love to see a full season of an upgraded T2 car (not discounting Chris Brannon's excellent 2008 season) to see where the weight, etc. should be. That is what it is going to take to get enough data to be able to make a judgement for performance potential. The T2 Camaro was 4. sec off Tom Sloe, but he was less than a second off Brian Wallace and Mike Lavigne. He was 1 second off Jeff Werth, a multi-time national champion. I would be probably be at least a couple seconds off Andy and Tom's pace, too. We'll never know, unless somebody races one. Let me say I'm just clearing up the facts here. The fact is that it's looking like the T2 car is gonna be hard to beat in T2 with it's new upgrades. Jim, as you know "JH has tested and setup" our t2 crossover and except for a minor brake issue it's ready to rock but with no funding unfortunately. I'll check JH's times, but I'm pretty sure he matched Kyles PIR race record in one of several a 5 lap tests so the car is fast. Of course I fully expect that Kyle's fast lap would be bested by at least 1 second Now with a top driver. JH ran our car at 3600 lbs. This is a rules "maximized" car built professionally. I am smart enough to use him as the barometer and will continue to do so.